Today we begin your journey to experimentation enlightenment. Cast off your preconceptions and assumptions. There is no room for complacency or ego in the experimentation dojo. The art of experimentation is learning to learn. Hypothesis-driven experimentation is a systematic way of exploring how to get to your vision, via measurable, reproducible results. It can be applied Growth experiments equally as well as it can to UI feature experiments. It is similar to the Scientific Method and shares the same goal: determining cause and effect relationships in a rigorous, objective manner. It is a powerful framework to guide your thinking. All of these stem from your vision, strategy, and objectives. Once you’ve completed the 3rd stage, your newfound knowledge and insights will inform your next experiments. 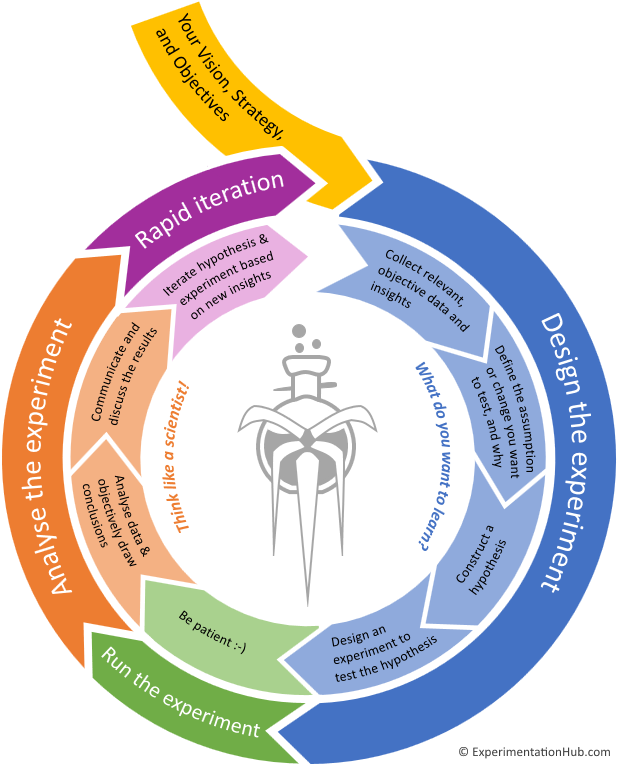 The cycle of experimentation continues, moving you closer to your goal with every step. Hypothesis-driven roadmaps and rapid iteration are a powerful way of reaching your vision.